I reported from an extensive tour of Western Slovenia in 2007, but that was just as this young company was being formed further east in Ormoz, north of Zagreb. Verus is the brainchild of three young winemakers, Danilo, Bozidar and Rajko, all of whom come from grape-growing or winemaking families, and who now own modern cellars and 10 hectares of vineyards growing exclusively white wine grapes on a bedrock of grey marl and sandstones at an altitude of between 300 and 340 metres. Diverse soils include sandy and fine soils on hills, whilst clay is found on lower slopes. The wines are extremely impressive. Screwcap, 12.5%. There’s a deal of salty, slightly smoky minerality on the nose here that is attractive, along with gently grassy notes and a little yellow plum and peach skin quality. On the palate a surprisingly bold and ripe rush of sweet fruit fills the palate, but all retaining that sense of delicacy and precision, with a brightness to the mid-palate and crisp, mineral crunch to the acidity. 89/100. £8.99. Screwcap, 13.0%. Two months of lees ageing gives this unoaked Pinot Gris a nutty, honeysuckle edge, with bold, ripe pear and spice notes, with some Ogen melon exoticism. On the palate this has an intense fruit sweetness as well as just a touch of residual sugar which adds a softening note to the spicy pear and apple fruit. The balance is very good, with fresh acidity and a nicely restrained yet quite full and flavoursome style. 88/100. Screwcap, 12.5%. Around 15% of this wine was fermented and then aged four months in new French oak barriques. It has a lovely nose, with a touch of honey and toffee, lots of almondy character and just a faint nettly streak over apple fruit. On the palate that immediacy of ripe, mouth-filling fruit is gorgeous, helped by its sherbetty edge of brightness and fine acidity keeping this mouth-watering and focused to the finish. The background warmth of the oak adds gently creamy spice. Delightfully poised stuff. 90/100. £9.75. 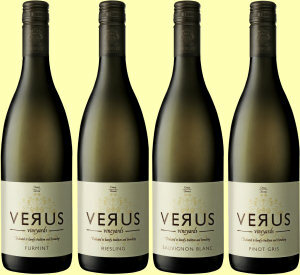 See all stockists of Verus on wine-searcher.com.